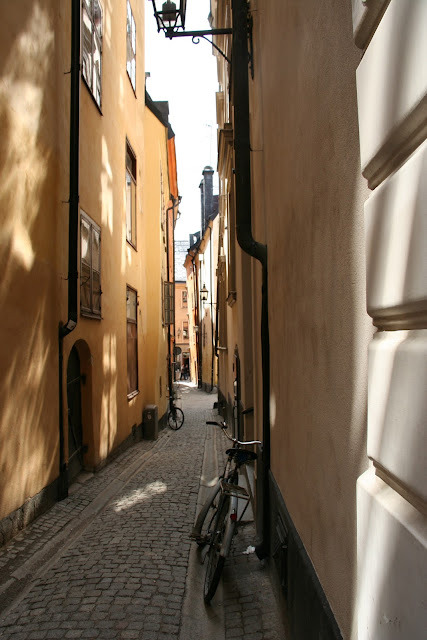 A quiet day in Stockholm, just Geoff and me. We are very tired today so the large crowds in the city wore thin and we are sitting waiting for a taxi to take us to the ferry. We heard from K&J and they are sitting in a park feeling exhausted as well, listening to the cricket! 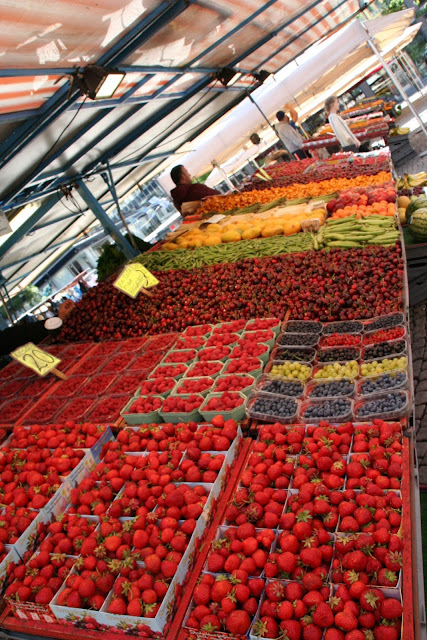 It is a glorious summer day, we visited the markets near the city early and the fruit and vegetables were spectacular. 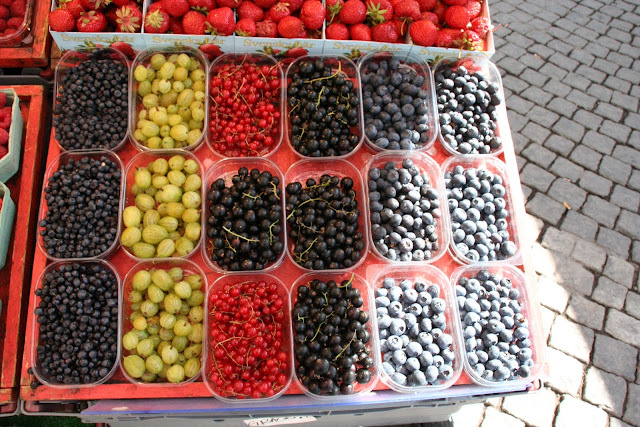 The berries look good enough to eat! 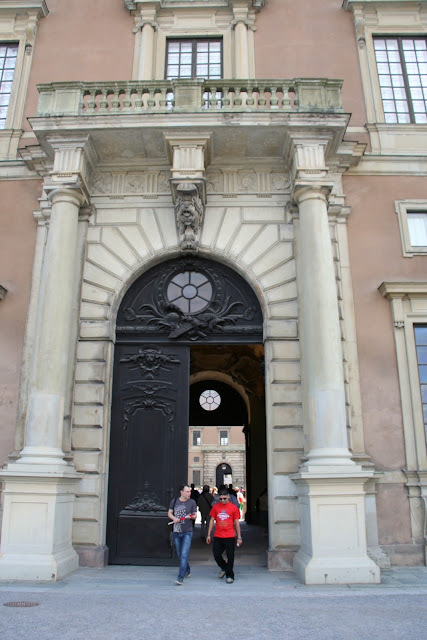 We walked up to the palace and into the vast courtyard. 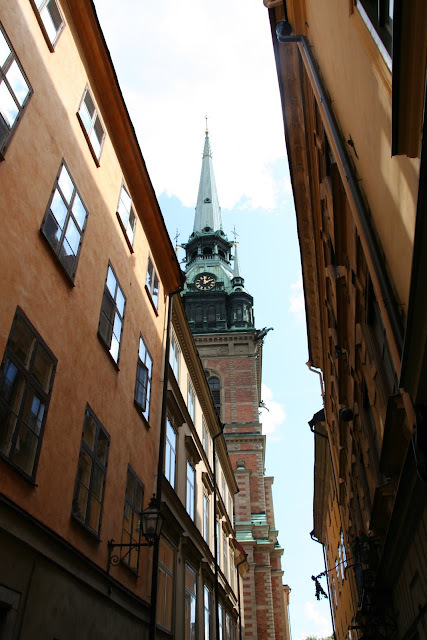 Then we went through Gamla Stan but the crowds were huge and we soon became tired of the people and being accosted by people wanting money. Views of the old town. 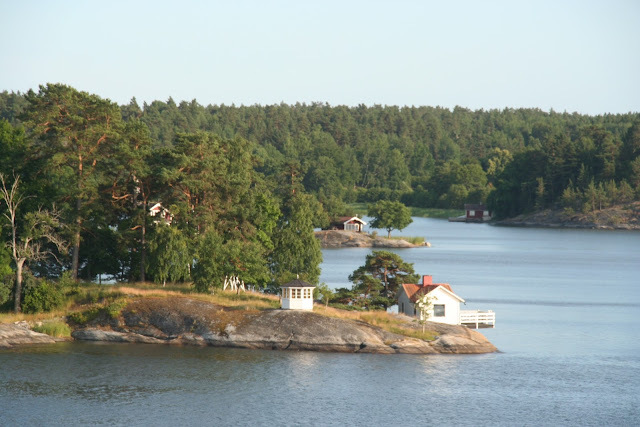 We are now on the ferry to Estonia and sliding through the Archipelago in the evening sunlight past hundreds of rock islands dotted with little houses, many red. 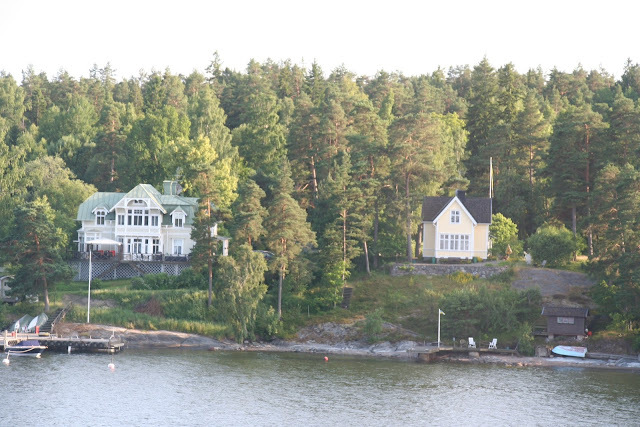 There are also some huge American looking houses but as we draw further away from Stockholm they become smaller in size and number. 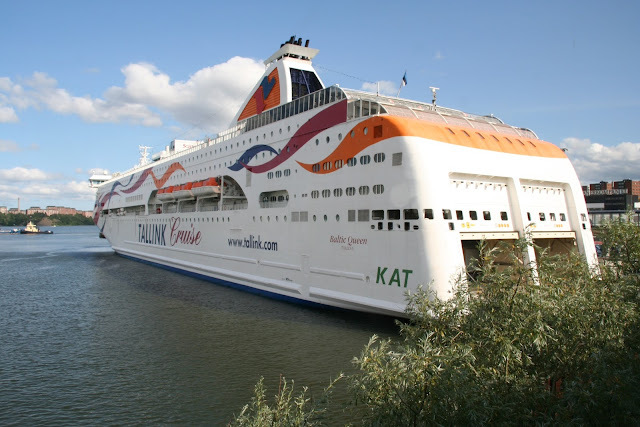 This is the monster of a ship we are going on, not my ideal ship, I much prefer Håkan's sized boat. 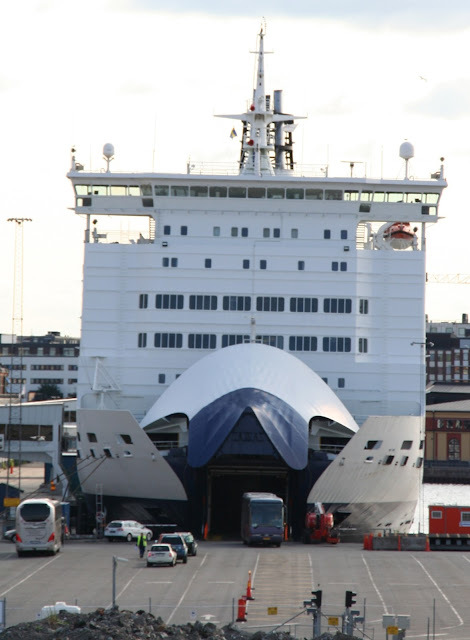 This photo gives you some idea of the size of these suckers, note the large bus entering. This one is teaming with rude people most of whom are now lining up in the duty free liquor shop Geoff says. 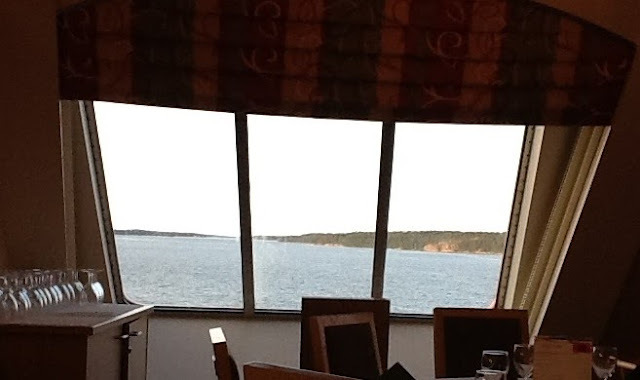 Thankfully we have a cabin with a port hole so we can see the island gliding by until it gets dark, oh yes, it never seems to get dark, I forgot. Little islands with tiny houses. 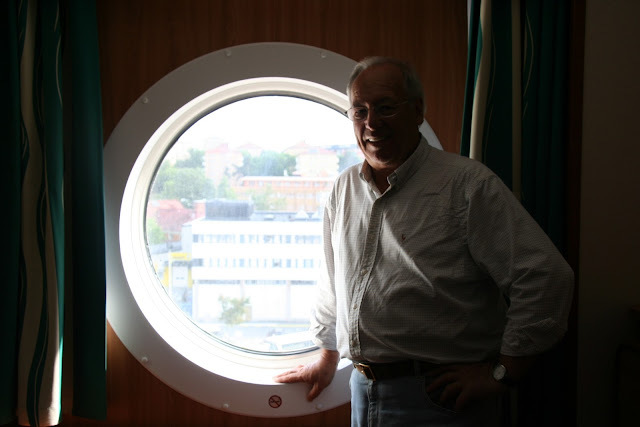 Geoff looking out of our port hole. We're off to the disco after dinner, I've spotted a few muscly fellows in singlets who were in the liquor line earlier. PS. NEVER book a buffet meal when you buy your ticket. The food is really delicious but the company leaves a lot to be desired. We do have an exceptional seat with a million dollar view.